Have you always dreamt of being told to “Come on Down” to play an array of spectacular games? I know we have! If you’re like us, then we have the perfect event for you! 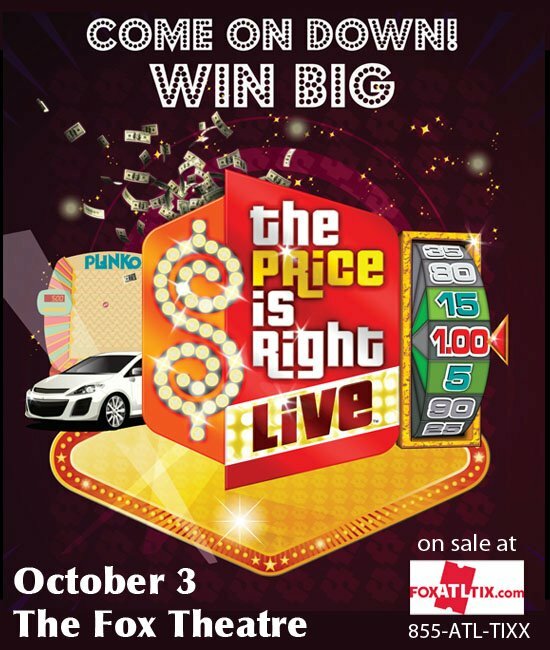 The Price is Right is coming to The Fox Theatre in Atlanta on October 3rd! The Price is Right is a classic interactive game show that pulls contestants straight from the audience for a chance to play iconic games from the longest running game show on television! Every game will be there, from Plinko to the Big Wheel to the fabulous Showcase Showdown! Contestants are given a chance to win amazing prizes such as appliances, new cars, and all expense-paid vacations to exotic locations. The best part is that you don’t have to have your name called to have a chance to win! Names will be called out throughout the show for audience members to win prizes just for attending the show! The Price is Right Live! has played to near sold out audiences for 6 years while giving away over 10 million dollars in cash and prizes. If you feel the rush of excitement and suspense just from watching this fantastic show at home, then imagine what it would be like to actually watch it live. The possibilities are endless! Tickets go on sale tomorrow, July 13, at 10AM! Does anyone remember the last time the price is right was at the fox? I remember sept. 1984 but was pregnant and that was due date so did not go. Im wanting to put on my tshirt” ive waited 27 years for this” etc….. its ok if bob wont be there this time, but i hated missing it at the fox. The fox cannot verify nor deny this? Thanks for any help on this question. I am not sure the exact date, but I also heard on the radio that Drew Carey was not going to host the event? Have you heard anything about who will host of the show on October 3, 2012?